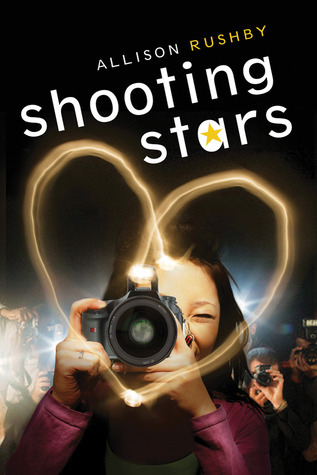 Shooting Stars by Allison Rushby tells the story of seventeen year old Jo, or Zo Jo as the rest of the paparazzo call her. That's right, Jo is one of the paparazzi. The people who run around L.A. chasing celebrities, camera in hand. But Jo doesn't want to be a paparazzo anymore, so when a newspaper editor offers her a chance to make a lot of money, enough to get out of the game for good, she has no choice but to accept. But when her target turns out to be Ned Hartnett, famous singer and international sensation, not to mention the only celebrity who has ever been kind to her, she starts to question her choices and whether or not the future she's planned for herself is worth the guilt that comes with it. Shooting Stars hooked me within the first few pages and kept my interest until the very end. It's an extremely cute story. It may be a little predictable in places but there are also a twist or two that will shock you. Jo is a funny heroine. She is doing a bad thing in order to make money to pay for her school, which would normally be considered a selfish reason, but on Jo nothing she does could look selfish. She's got so much back and forth inside her head. "Is this right? No. It's a bad thing to do. But it's my job. I'm being paid. I said I would. But can I really do it?" over and over again. You might think it would get boring, but Jo's dry, sarcasm keeps things from being boring. I really enjoyed reading about her and found myself laughing out loud... a lot. I couldn't figure out what Ned's issue was, why he was at the facility. I NEVER saw the twist coming. I had theories and all, and I was even right about some of them. But the major twist, you'll never see coming. But at the same time, it makes perfect sense once you know about it! You sort of feel like your dangling in mid air, your whole world (well, Jo's world really) is turned upside down in a matter of seconds. Even the side characters were great! Katrina was just adorable. A tall, lanky ex-ballerina who was just the right amount of goofy to offset Ned and Jo's tender moments. And I actually like Seth! I don't know why, exactly. He's sort of just the annoying guy in the group, but he's had such a terrible experience. Rushby set up Seth's introduction in such a way that, I already knew his backstory, so I immediately felt awful for him, and when he opened his mouth and spoke I just couldn't be annoyed by him. Plus I found his witty, sarcastic comments to Brad almost as funny as Jo's were. There is one part, right before the end, where things slow down and become a little repetitive. It's mainly just Jo worrying a lot (although she does use a good reason) broken up by a few funny little scenes that neatly tie up some loose ends. It didn't detract from the overall awesome of the book, but it slowed the pace down a bit. But luckily the pacing picked back up soon after. Fans of Jennifer Echols and Stephanie Perkins will undoubtedly enjoy Shooting Stars. It's a totally cute romance that anyone, young adult or not-quite-as-young adult, will want to read! I've been skeptical about this one, but now I think I'll try it out!